Po Fat Tak Trading Co is the mother company of T.P. Crystal Trading Co.. In the early years, Po Fat Tak was a company which professions in designing and manufacturing of jewelry and crystal. The mission of our company is to service both local and international customers with our custom made and unique design crystals . Through years of hard work, a strong foundation was built. We decided to develop our crystal products more professionally and more diversities. T.P.Crystal was founded in 2002. 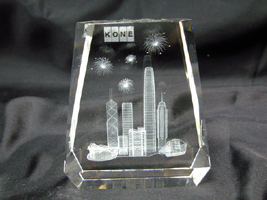 T. P. Crystal specializes in creating personalized optic and lead crystal gifts and awards, such as corporate trophies, premiums, souvenirs as well as office accessories.Our techniques include and 2D / 3D inner laser imaging and Sandblast. We offer our customer a one-stop service. We can incorporate your logo, message, and any artwork of your choice to produce an unique crystal of your own. To make your job easier and ideal, our experienced designers are pleased to provide you plenty of suggestions and ideas. A competitive price and prompt delivery is our promise to customer.